AAG is short for Autoimmune Autonomic Ganglionopathy and is a rare form autonomic dysfunction caused by a cell danger response. In most autoimmune diseases, there is an event such as a viral illness or fever, but long after the threat is gone, the cells develop a "danger response" and instead of attacking the intruder that is no longer a threat, the cells attack in different ways. In AAG, the attack is on the small fibers of the nerves in the body. There are a great deal of unknowns and many physicians confuse symptoms of AAG as POTS (Postural Orthostatic Tachycardia Syndrome) or mitochondrial disease. There are tests that can determine AAG called aChR, or Acetylcholine Receptor Antibody. ​In Mad's case, she is negative for aChR antibodies but was diagnosed with AAG based on clinical symptoms. Titers are only positive in approximately 50% of all cases. Mad's symptoms have varied over the years. In the beginning, her primary symptoms were GI dysmotility and as time passed, new symptoms cropped up over the years as time went on and she remained undiagnosed and untreated. Mad was previously healthy prior to a viral inner ear infection in the spring of 2007. In August of 2007, everything changed and she was unable to eat. She spent most of 2007-2009 on TPN as she did not tolerate feeds into her GJ tube. Most of those years, she didn't even tolerate the fluids in her stomach and had to keep her G tube on constant drainage. In October, 2008, she suffered from acute infectious polyneuritis (a variant similar to Guillain-Barre) that left her unable to bear weight on her legs until February. 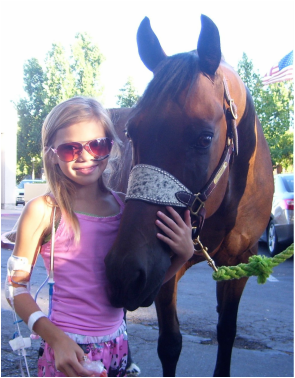 In December, she was sent by medevac to Cleveland Clinic for mitochondrial disease testing. She then underwent intensive inpatient rehabilitation, and recovered mostly. From 2008 to 2009, we went to 16 new patient appointments at various facilities throughout the U.S. desperate for help and answers. Finally, in 2010, we landed at Children's Memorial in Chicago with Dr. Nancy Kuntz. At the time, test results showed an autonomic small fiber neuropathy. With the diagnosis came treatment, 1 gram of Solu Medrol every 2 weeks for 3 months. Following that, Mad's GI symptoms resolved though her leg pain continued. Upon beginning IVIg infusions with 2g/kg of Gammagard, she went into a complete remission for about a year and a half. At that point, her symptoms returned despite infusions and we tried various chemos (Cellcept, Imuran, and Remicade). In February 2015, she was inpatient at Lurie Children's and began plasmapheresis for treatments every other day for a total of 5 treatments. This greatly reduced her symptoms but had its drawbacks with central line access. In January 2015, we contacted Dr. Richard Burt, an immunologist at Northwestern Medicine in Chicago, in hope that he would accept her for an autologous hematopoietic stem cell transplant for autoimmune disease. In May, she was accepted on compassionate care basis and in July, she began mobilization and harvest. On October 14th, she received her stem cells back and was discharged from the hospital and came home to California to recover. As of July, 2016, she was weaned off all pain medications and started taking college classes.